As promised, a brief resume of my fishing trips since you left. I`ve been about 5 times to the `snook beach` in a variety of conditions from calm and windless to rough with a biggish swell – all with the same results, bugger all! Clearly the snook miss his old dad!I will keep trying every set of tides: the snook will be back, that’s for sure. I had a fascinating session at Paulo’s pier on Sunday. It was low tide in the middle of the day (the only time us ‘family men’ are allowed to go), and the current was running hard out to sea. 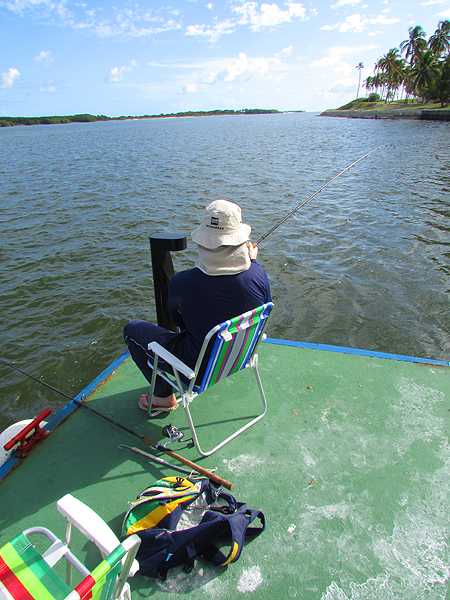 Paulo soon had a bucket full of livebaits, including some nice captainfish up to about 15cm. Last time I fished at the pier I’d noticed that a lot of my bites on the live bait did not seem to develop into anything substantial, possibly because of the paternoster rig I was using. This time I thought I would give the fish a bit more freedom, so I set up a running leger with a smallish weight (just enough to send the livebait slowly down to the bottom in the fast flow of the ebbing tide). I set myself up at the end of the pier so that the rod tips were pointed in the direction of the current and lobbed out a captainfish on each rod. I carefully laid the rods down and slackened the clutch to easily give out line. Paulo also had two rods with running legers which he fished out in the main channel using much heavier weights and a tighter clutch. The action was pretty non-stop for the 2 hours we fished. After only 5 minutes I had a good run which dropped the bait before I could tighten the clutch. This was quickly followed by another fish that did the same thing. 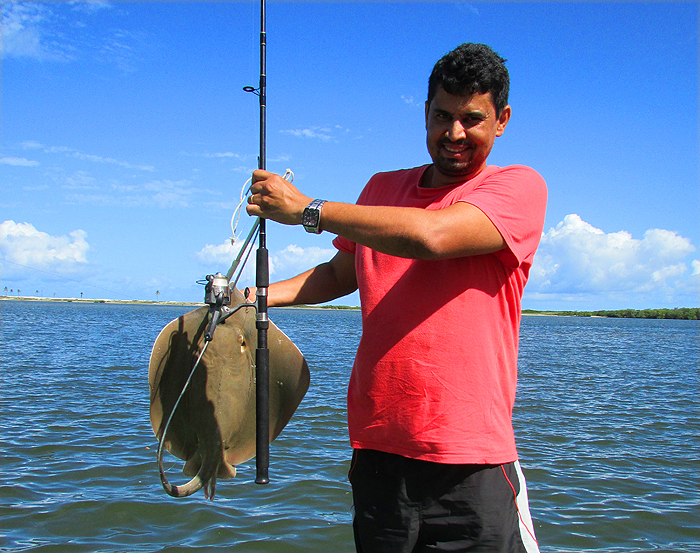 I looked up to see Paulo into a good fish – after 10 minutes of hard work against the current a nice stingray (about 15lb) swung into view. After carefully unhooking it, being careful to avoid the poisonous spine, I took a few trophy shots and Paulo slid it back into the water. I then had a funny stop-start bite that turned into a little snapper of about 2lb which had, unfortunately, swallowed the circle hook. This was followed by another fish dropping the bait after a good run – could they be feeling the pressure of the clutch, even though it was really lightly set? (I reckon so - I had exactly the same comment from a bass angler last week. M.L.) I changed tactics: I grabbed a beach chair and sat with the bale-arms open and the line in the fingers of either hand. I actually prefer fishing like this – there is something really special about feeling the line rushing through your fingers. 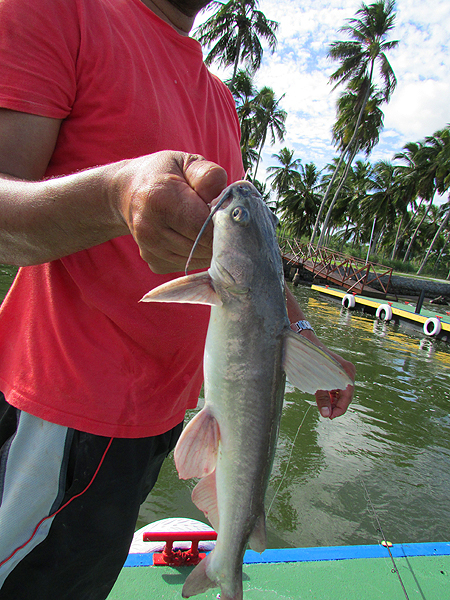 I immediately had a bite that I let take 10m of line before flipping the bale-arm and gently tightening – after a brief fight I slid a nice sea catfish of about 3lb onto the pier. Next I had a strange, slow bite which took the line in ‘jerks’. I tightened into a substantially bigger fish that turned out to be a disgusting green moray eel of about 10 lbs, much to everyone’s amusement. Luckily, it managed to saw through the 40lb nylon trace just as we were trying to gaff it, saving us the slimy task of unhooking it. The next bite was really interesting – something big grabbed the bait and sprinted off into the main channel. Unfortunately, it dropped the captainfish when I tightened and, when I wound in, the bait had been squeezed in the middle rather than hacked in half. This suggests it was probably a crevalle since most of the other common fish in this spot (catfish, rays, morays, puffers) rip the baits. I then landed another catfish almost identical to the first. The bites kept coming, but we stopped hooking them and started winding in dismembered live baits. This is a sure sign of big pufferfish, a suspicion that was confirmed when Paulo played one into the edge before it sliced through his line. That's the way to do it! The easiest fishing in the World..
One of Richard's catfish held by Paulo.